It’s a funny (and not funny) story because just the other day, I got my credit card paper statement in the mail of all my charges from the previous month – not funny because that hefty number at the bottom of the statement was painful to swallow; funny because, well, who looks at these paper statements anymore? I mean, they still send those things? Today, even carrying cash or paper checks is completely obsolete. Take a look at your local department store or coffee shop and you’ll find consumers using pay-by-phone apps or swapping their debit cards for a good ol’ cup of joe. It is undeniable that the financial technology industry is becoming more targeted to the millennial generation, something that can be owed to the rise in mobile activity, as well as the emergence of new disruptive innovation evident in the past 5 years. The mobile wallet and online services, even trading, personal finance management, and crowdfunding platforms, have proven to be huge assets to millennials. That’s a pretty noteworthy statement, if you ask me. But it’s to no surprise, because according Serro, they are the “least financially literate” (sorry to break it to you, kids). A Western Union Survey reveals that 38% of millennials pay their bills using their smartphones, with 55% of entire payments being made by millennials, according to Zapp, UK’s leading mobile payment brand. Another astounding figure by Zapp reported that 70% believe that in the next five years, millennials and tech savvy people who are adopting mobile payments, will pay for things differently. The impact of mobile payments will be much larger than on the Millennial scale. Millennials might lead the way, but the amount of consumers preferring smart payment over not-so-smart plastic will be much wider and will only exclude third age consumers. It is clear that financial institutions need to offer services and products on a digital, particularly, mobile platforms. This way, they will be sure to stay ahead of their competitors and differentiate themselves from others. This applies particularly for the Fintech space. Millennials and tech savvy consumers today are used to sleek and modern interfaces, which offer instant sync functionality on their smartphone’s and tablets. In fact, they usually check their phones 43 times a day on average. Real-time response is no longer a nice-to-have feature. It is now required. For example, if a user’s balance does not update immediately after their most recent purchase, you can kiss your good user experience goodbye. 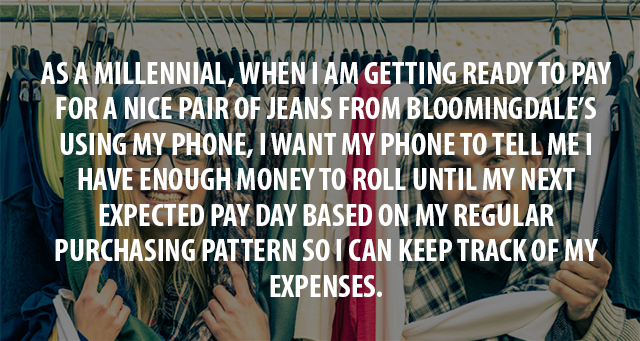 The expectations of millennials are that there should be no issues toggling between apps. In the UK, it has been noted that people usually switch devices around 21 times every hour, which includes TVs and smartphones. This is an amazing number! More to it, 90% of people tend to switch between devices, using them in a simultaneous manner. 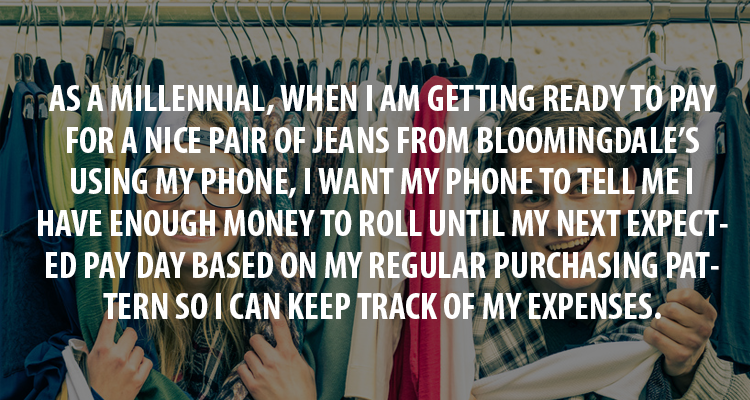 The profession of today’s millennial consumers is built via social networks. They work seamlessly with various social platforms. Today, it has become more of a necessity to integrate social sites into business practice, when it comes to information flow, as well as online presence. The attention of millennials is moving towards great content so much that about 63% of them stay up to date on various brands right from their social sites. What’s more, 46% of them solely depend on social media, when making purchases, while 43% have liked over 20 brands on Facebook. Technology is rapidly changing things today. Several years ago, it would have been practically impossible to see a consumer paying using their mobile phones, but today this is a “no-brainer”. 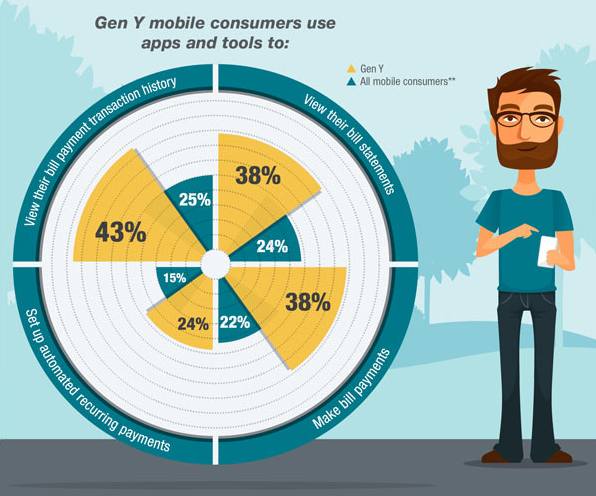 Millennials’ preference to use their mobile devices to make payments is a milestone for financial technology companies and has greatly impacted future of user experience design. Do you have any strategic tips or UX best practices that you want to share with us? Feel free to get in touch with us via Twitter or Facebook.